Since the 1964 Civil Rights Act was passed, The Department of Housing and Urban Development (HUD) has expanded its mandate to enforce these laws by labeling everything that is not equal, from the educational experience and housing, to the relative wealth of your residential zip code, as discriminatory. HUD, formed as part of President Johnson’s “Great Society,” has assumed the role of lifting the poor from poverty. A “great” cause perhaps, but one which the agency is ill-equipped to administer. HUD employs initiatives like “Move to Opportunity” and “socio-economic diversity” to pull low-income families out of poverty…by moving them. The theory goes that by living in more affluent areas, the success of the well-off will carry over to those who are struggling. Soon to be HUD Secretary, Dr. Ben Carson, in a 2015 op-ed, compared the Obama administration’s efforts to the “failure of school busing.” He is right. Relocating low-income families as if they were hair plugs in a federally funded transplant operation does not grow prosperity. Just ask the families in East Palo Alto, California where students have been shipped into tony Silicon Valley for nearly a quarter century. At best the results are mixed and decades later, classmates still hang out with their friends from the old neighborhood. HUD’s anti-poverty approach is reminiscent of Mark Twain’s old truism, “To a man with a hammer, everything looks like a nail.” To HUD, armed with civil rights law, everything looks like discrimination. But communities are already beginning to eliminate poverty using faith based programs that help people get jobs and leave discrimination in the rearview window. 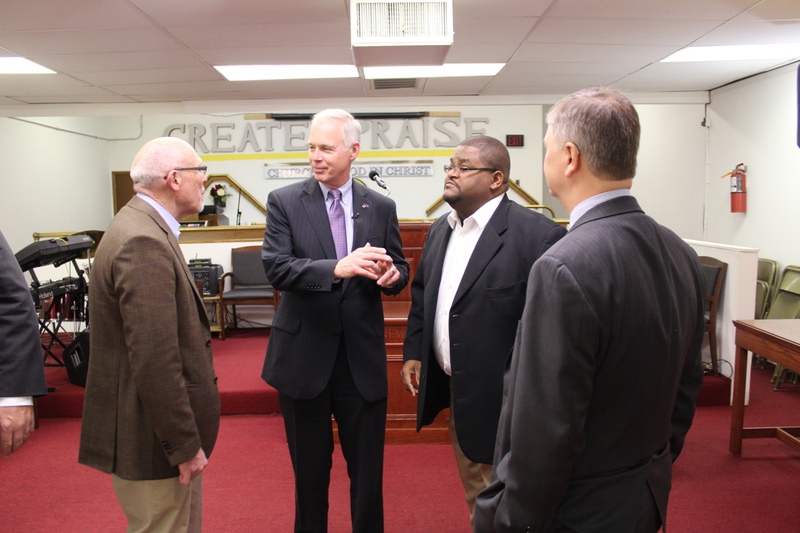 In Milwaukee, Wisconsin, Pastor Jerome Smith is working with Senator Ron Johnson (R-WI) to develop the Joseph Project. Sen. Johnson, formerly a successful business owner, knows that good paying jobs are critical if people are to exit poverty. But, good jobs require solid training and emotional fitness. The Joseph Project teaches class members from low-income communities the fundamentals of communication, resume completion, and how to present themselves at the hiring interview. Pastor Smith is a street-wise, high-energy, speaker who connects with students through his emotion-filled messages that include spiritualism, tough love and self-help. Instructor Scott Bolstad ducks his head entering doorways. The big man hammers home the ABC’s of landing that new job with gutsy straight talk and active role-playing that engages the students and brings them back ot class on time. Scott expects no less. By the end of a single week, the class is a team. The Joseph Project has a placement record that would be the envy of most professional job firms. As of this writing, 76% of graduates found better paying jobs than before taking the classes, and once hired, their retention rate is 70%. I visited with Ron, Pastor and Scott in February. We will be working together to help launch the Miss Mary Project in Chattanooga, TN. In addition to interviewing and soft-skills, the Miss Mary Project will also provide training in budgeting, building savings, and financial responsibility. Students learn that property rights include the money they earn and the home they one day will own, and why it is important to be wary of programs that limit the use of personal property. The Miss Mary Project provides mentors and a long-term follow-up program to help graduates remain committed to their own financial and spiritual success. Finally, we show students why no one can be independent until they are free of the government. For those used to accepting federal help, this is a new message, but one we find they appreciate. By increasing voucher values, food stamps and free programs, HUD does more to institutionalize dependence than to foster upward mobility. The real key to prosperity is to help people stand on their own so they do not need federal help. Programs like the Joseph Project and the Miss Mary Project create real sustainable success that can blossom into prosperity and change lives. If HUD will use their vast communications network to support those community efforts, we will shrink poverty.